Capers Island is located on the Atlantic Ocean just fifteen miles north of Charleston. The undeveloped haven lies between Dewees Island and Bulls Island, separated from the mainland by the Intracoastal Waterway. Originally inhabited by Native Americans, remnants of shell middens can be found on the southwestern portion of the island. It is known that the Seewee Indians had a nearby village at Bulls Bay and a fort at Toomer Creek in 1685, and shell middens on Dewees Island date to as early as 2000 BC. Three French Huguenot brothers from Wales – Gabriel, Richard, and William Capier – settled on the island in 1679. Richard and Gabriel continued to live here and their descendants occupied the island until the Civil War. The island has changed names several times. It was called Sessions Island from 1675 to 1705; it was then referred to as Capore Island until 1722. The Magwood family owned Capers Island in the early years of the twentieth century. Coulter Huyler, a New Yorker whose family was once the largest chocolate manufacturer in America, purchased Capers in 1924 for $35,000. At the same time, Huyler bought neighboring Dewees for $25,000. The Reynolds Corporation acquired the two islands in the late 1950s as a hunting and fishing retreat. In 1961, a 100-acre impoundment was built to attract waterfowl. The Royal family bought both Capers and Dewees in 1972, but the State of South Carolina purchased Capers three years later, in 1975, for $2.65 million. The acquisition was part of the Heritage Trust Program. The semitropical island is relatively small, measuring just 1.4 miles wide and three miles long. 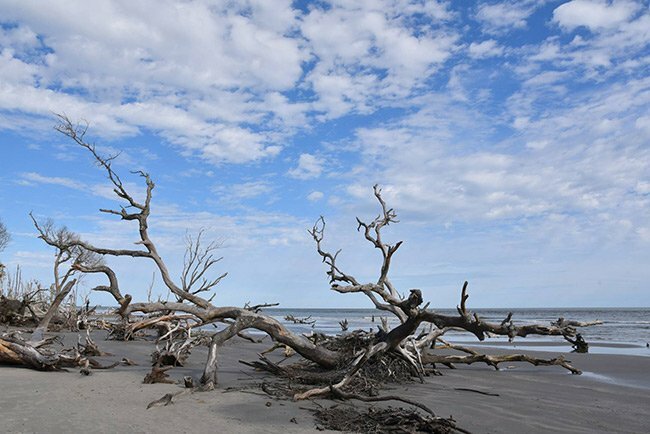 While the island remains in its natural state and is uninhabited, it is maintained by the State of South Carolina and visitors are welcome. A small dock allows guests to disembark. A boardwalk crosses the marsh to an unpaved nature trail where visitors are able to access the beach, roughly a mile away. Limited primitive campsites are available with proper permits issued by the South Carolina Department of Natural Resources. Several local companies offer private tours for those who do not have access to a boat. The island consists of many different ecosystems, including 850 acres of maritime upland forest, 214 acres of beachfront, 1,090 acres of salt marsh, and over 100 acres of brackish ponds. (1) Due to this diversity, wildlife is abundant. Alligators, snakes, white tail deer, raccoons, and countless species of birds make the island a popular spot for nature enthusiasts. 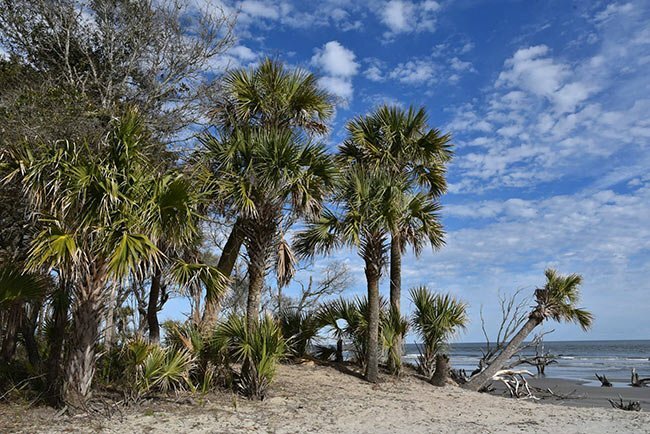 The island is part of a 60-mile stretch of land that has been protected from development; this area also includes the Cape Romain National Wildlife Refuge, the Santee Coastal Reserve, and the Tom Yawkey Wildlife Center. 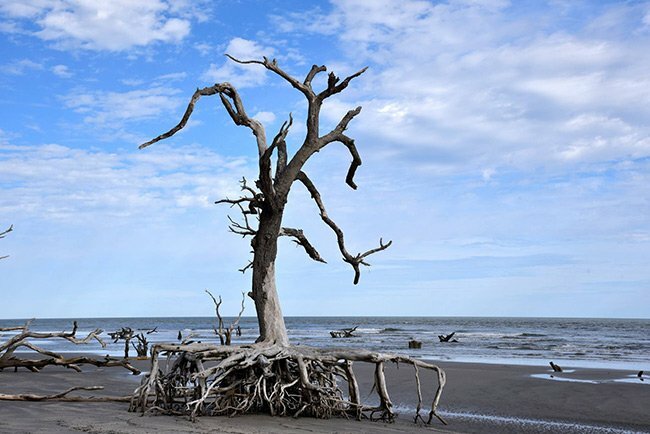 One of the most stunning and interesting features of Capers Island is its “boneyard beach.” The stumps and branches of palmetto and oak trees marooned by erosion have been bleached white by the sun, resulting in a skeletal appearance. 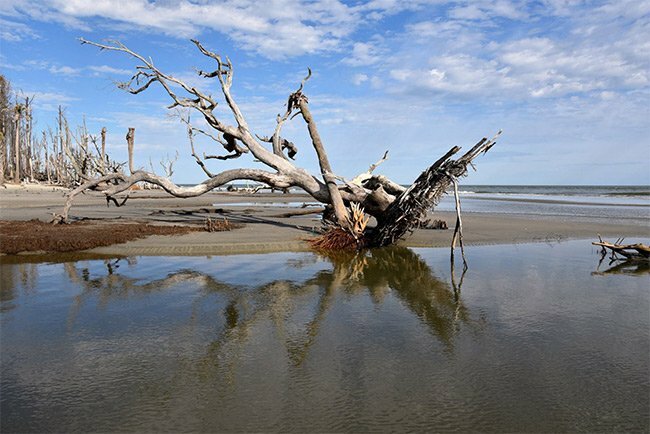 Boneyard beaches have been found on other barrier islands – including Bulls Island, Botany Bay, and Hunting Island – but sadly, many have washed away with the tide. You can read more about Capers Island, along with other barrier islands here.